This tutorial will be completed in multiple parts. The idea is that any of these techniques can be stand alone, or can be combined in any number of combinations depending on what effects you want. There isn’t a specific order of operation but a matter of personal preference. For the purposes of this tutorial, I’m starting with the filter/fade technique. This technique is similar to the wash technique for panel lines. There are rules that MUST be followed for this technique to be successful. The kit’s painted surface must be protected with a clear coat that is a different type of paint from the filter. On the Gouf Custom’s leg in this example, the paint surface has been clear coated with a lacquer based gloss, Mr Super Clear Gloss. The clear coat layer has been cured for a full day. 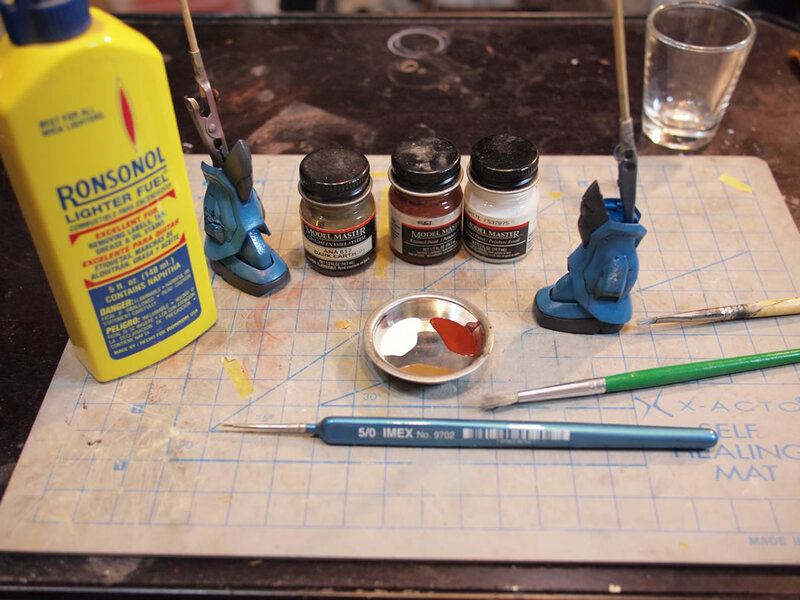 Next, I’m going to use enamel based paints which do not react with the lacquer based super clear. Effectively, for some of you folks that use graphics programs, I added a new layer when I clear coated the surface. The underlying paint, decals, panel lines, etc, are preserved under the clear gloss. 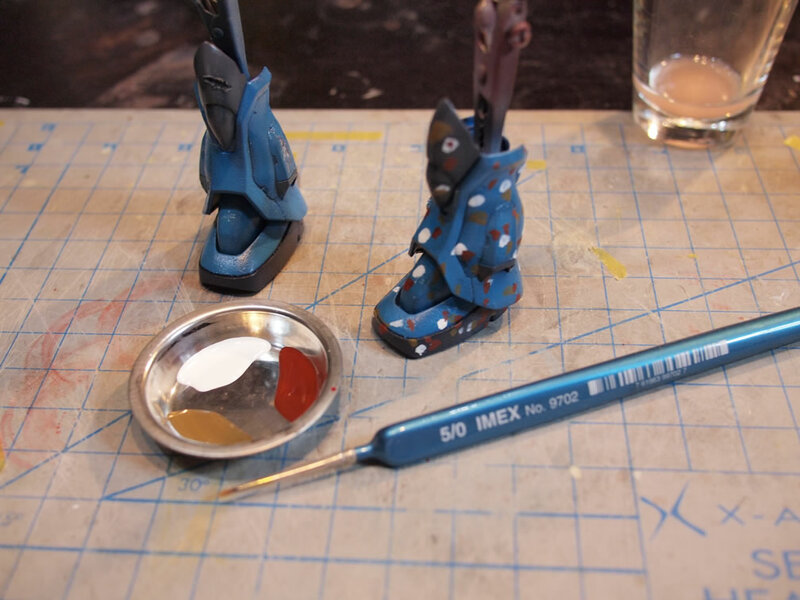 The Gouf Custom’s leg is now dotted up with different colors of paint. Note that the choice of colors is entirely personal. 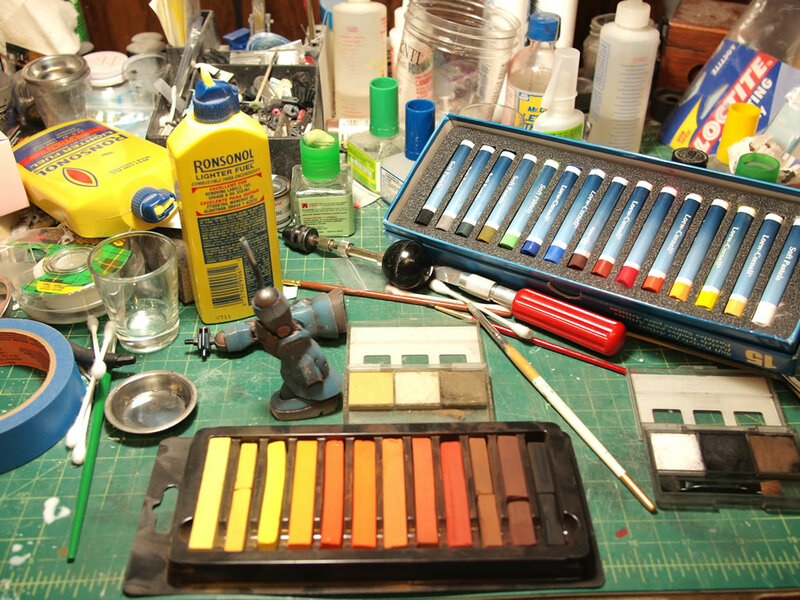 Color choice should be based on the ideal environmental effects you want affecting your model. 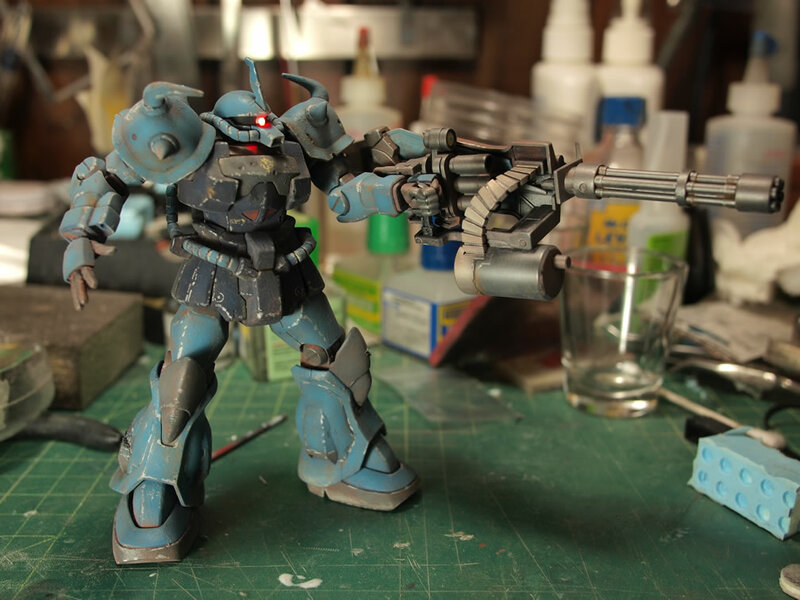 With the part dotted up, here is a picture with both Gouf legs for comparison. Now with the dots blended, you can clearly see that one leg has a great deal of tonal variance and looks quite weathered. Below are a two pictures showing the comparison between the two legs on each side. After the filter/fade has cured, you can optionally spray a lacquer clear coat to preserve the filter before moving on. Again, this is the layering technique of saving your previous work with a protective layer of clear before moving on to the next step. With that done, I’m using an enamel based paint for the paint chipping. Color choice here is also open to personal preference. For this demonstration, I used a metallic silver. 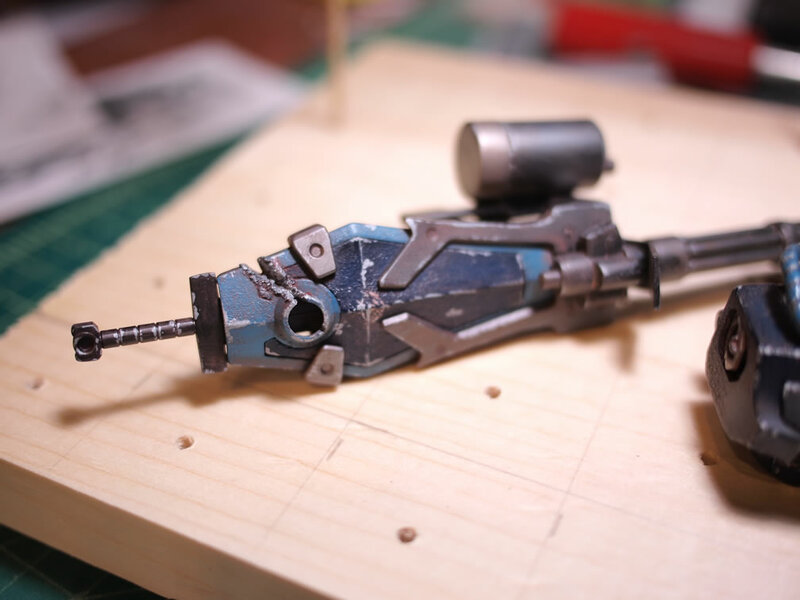 It is also very easy to go overboard with this technique, but again, the amount of weathering is personal preference. Depending on the situation, you may need more or less weathering. Here are some pictures of the legs for comparison. For some close up pictures, the chest piece looks almost like I went a little overboard with the paint chipping. It is a good idea to look at your other pieces and keep a certain balance so that the weathering isn’t overly heavy on one piece in comparison to another. 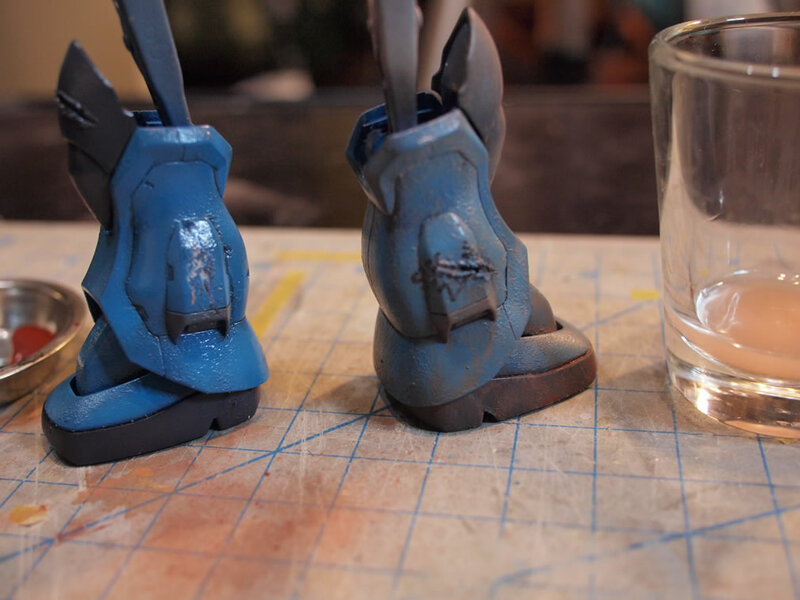 After the clear flat has cured, we can move on to the third weathering technique. This technique uses pastels and pigments to create effects like rust, dirt, dust, oil stains, etc. This technique relies on a flat coated surface as the tiny bumps on a flat coated surface work to hold the pastel or pigment particles. These particles will not stick to a glossy surface; so it is very important that the surface of the parts are flat coated. Here I will be using chalk pastels and weathering kits from Tamiya. The pastels I use are found at your local art stores and are soft chalk based. Using a hobby knife or sand paper, I can grind/scrape the pastels into fine pigments into a paint tin, then apply the pastels with a brush. Once applied to the surface, a q-tip, cotton swab, or paper towel can be used to blend the pastels or create directional streaks. Using some lighter fluid with the ground up pastels is another application technique, and I can create little oil stains with the black pigments and the lighter fluid. 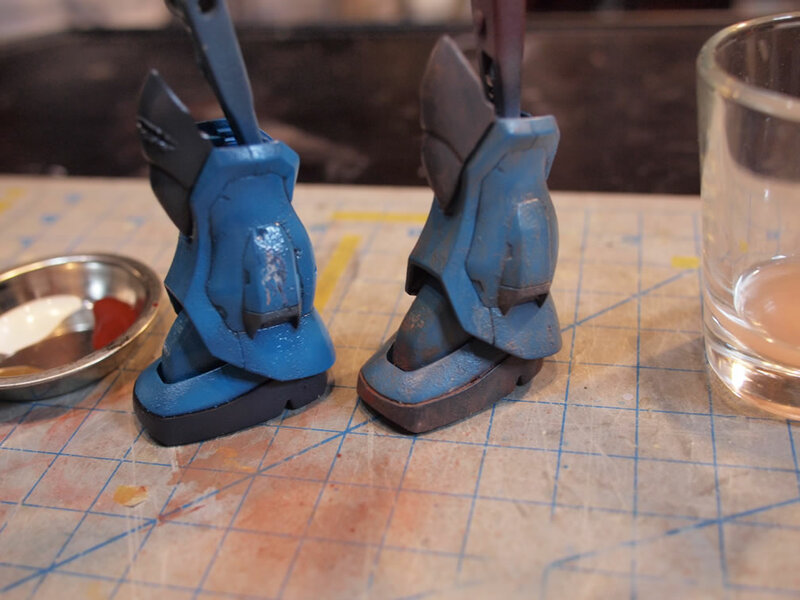 The Tamiya weathering kits work the same as the pastels, they’re just already ground up. The benefit of the pastels is that you can grind different colors and custom mix a color. The tamiya weathering kits are basically glorified makeup sets without the perfume. 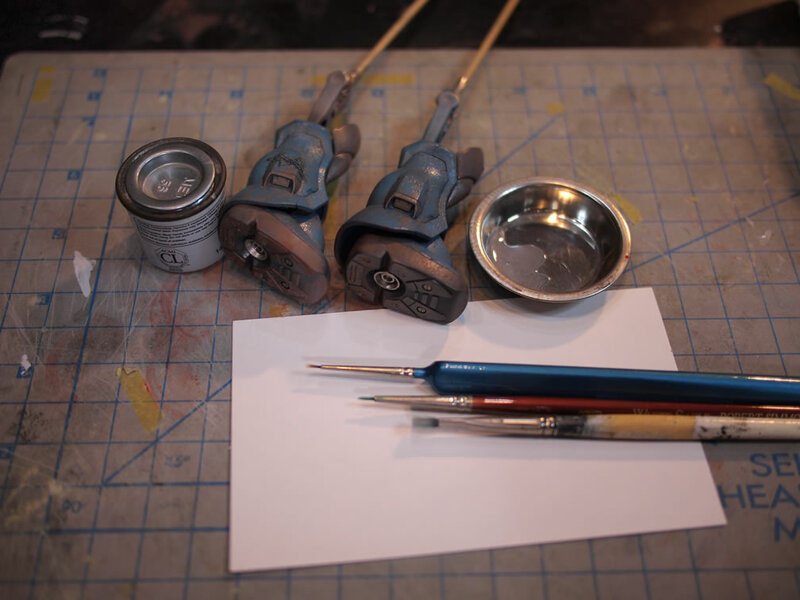 Modelers have been known to use makeup kits to create these weathering effects on their kits. Below is a video that shows the application of the pastels and pigments to the surface of the kit. Below is a comparison picture of the legs. 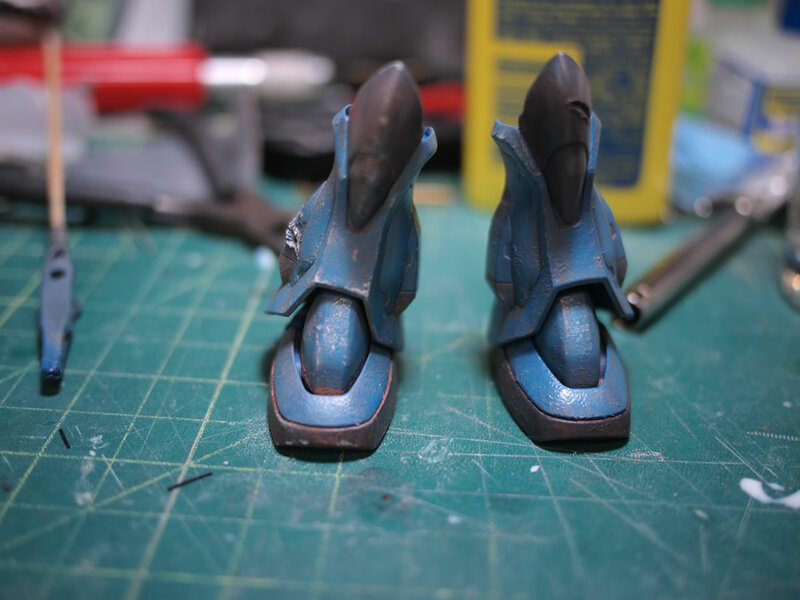 After this third weathering session, I sealed everything up with an optional clear flat. Since I travel and handle my kits often, I spray on a final clear flat to seal all the pastels. This is completely optional. The clear flat has a tendency to fade out the pastels so a little heavier pastel weathering may be necessary if you are planning on sealing this. There are modelers that do not seal the pastels as they feel that the additional clear flat will diminish the pastels effect. 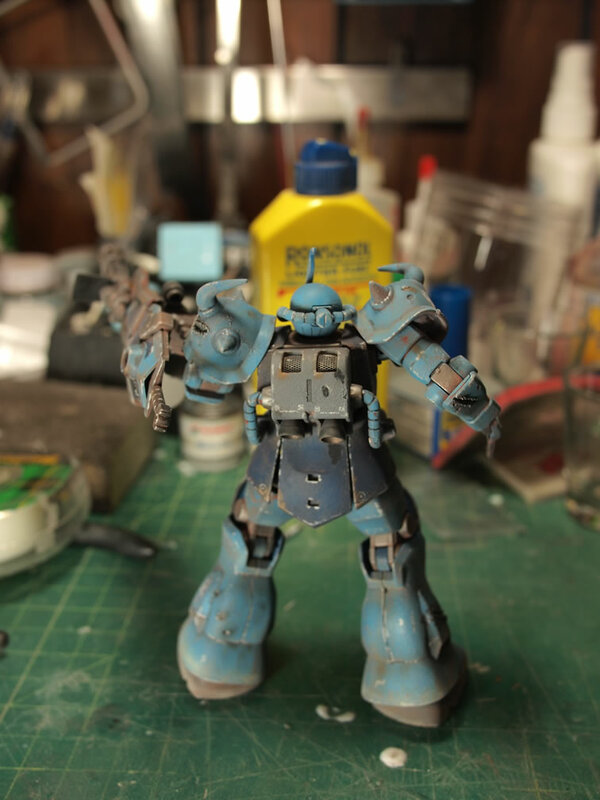 Here are some sample picture of the Gouf after application of the three weathering effects. 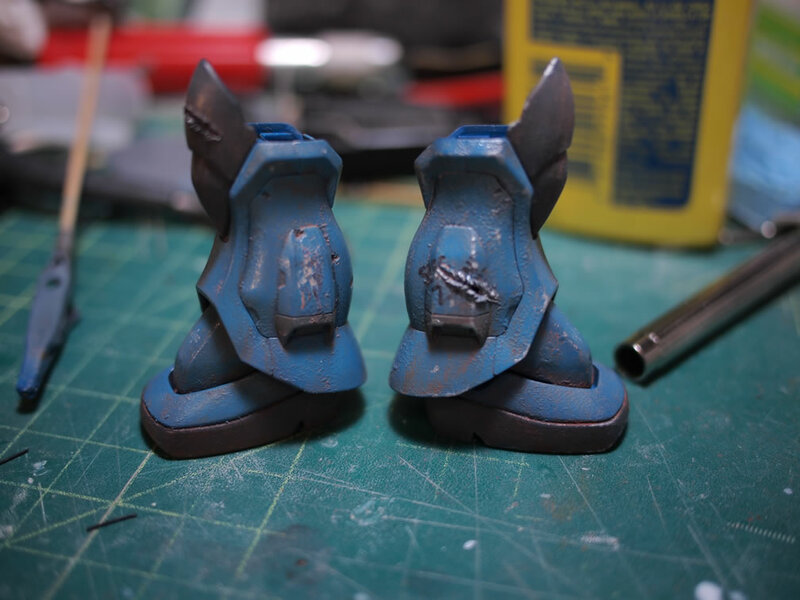 Soot marks were added to the bullet areas, some rust is added to the corners where the paint was chipped, dust was added to the feet to show the terrain the suit has been traveling through, oil stains were added, and dirt is added in the corner areas of the kit. Pigments are a very powerful tool for creating a huge array of effects. 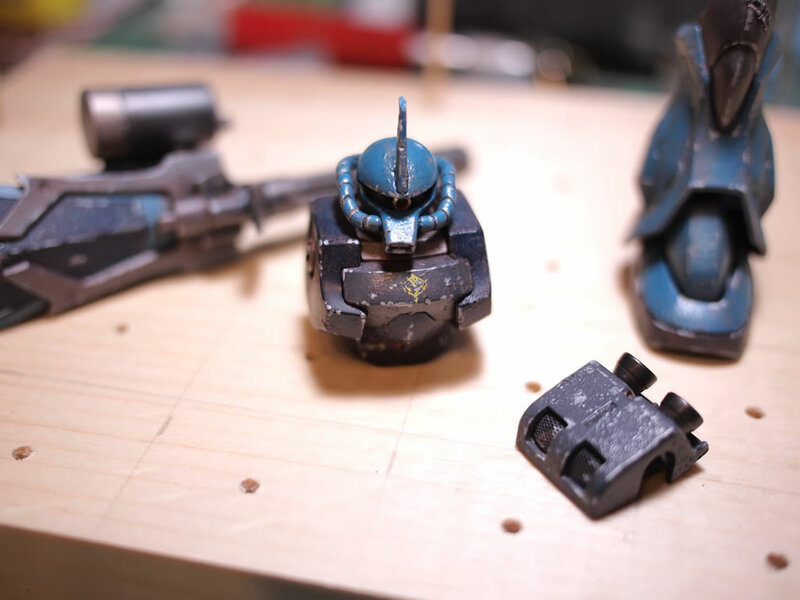 This concludes the three basic weathering techniques. There are hundreds of variations on these techniques and several cool effects that can be achieved. Using these three basic weathering techniques, it is highly recommended to experiment further to explore additional effects aside from what was shown here and in the videos. This is a very powerful technique. 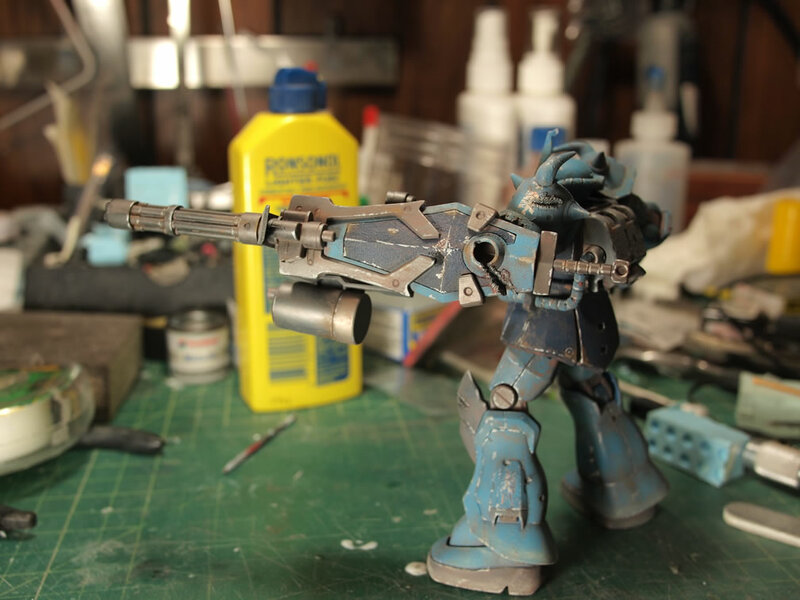 An alternative method often used in armour modeling is to apply a thinned (5% paint/95% thinner) full surface wash over a clear flat coat to filter the surface. The advantage of the dot method you use is it can go over a gloss or flat clear coat. Both technique are absolutely awesome for adding depth to a surface. 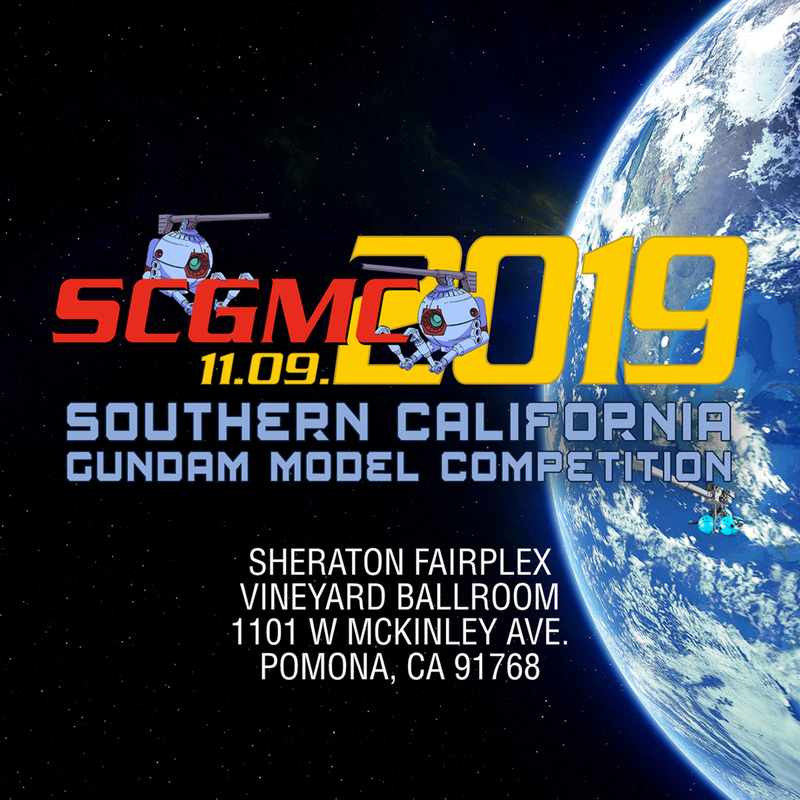 Has to be one of THE BEST/MOST THOROUGH weathering write up I have ever read, thank you for writing this! I found it extremely useful and easy to follow :) Well done! sweet tutorial!!! very detail.. you make the weathering effect so easy for a newbie.. thanks!! Fantastic article! This will definitely help me add a whole new level to kits. 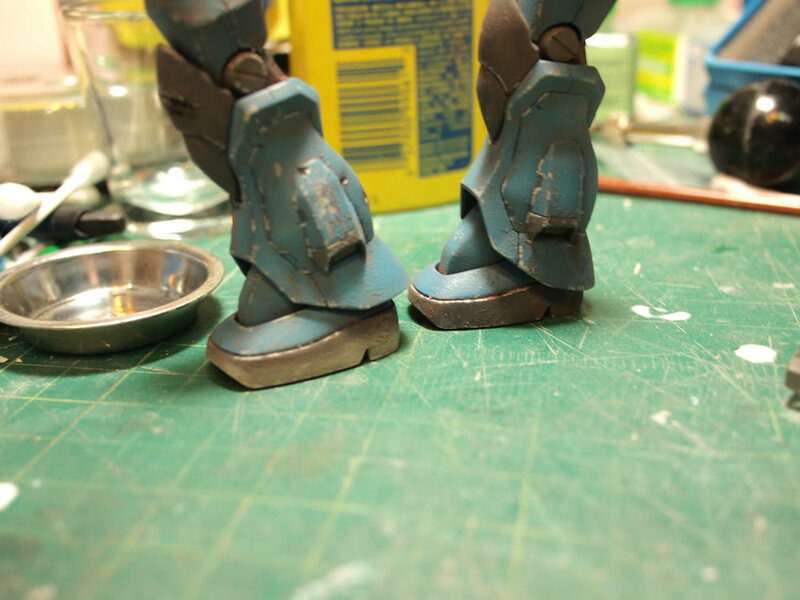 Could you give me info on how you put the LEG into your 1/144 Gouf custom? Can I do this with a snap build?